Police End Las Vegas Shooting Investigation; No Motive Found Police investigating the October 2017 attack said they've been able to answer the "who, what, when, where and how" of the massacre, but as the probe ends, officials cannot explain the "why." 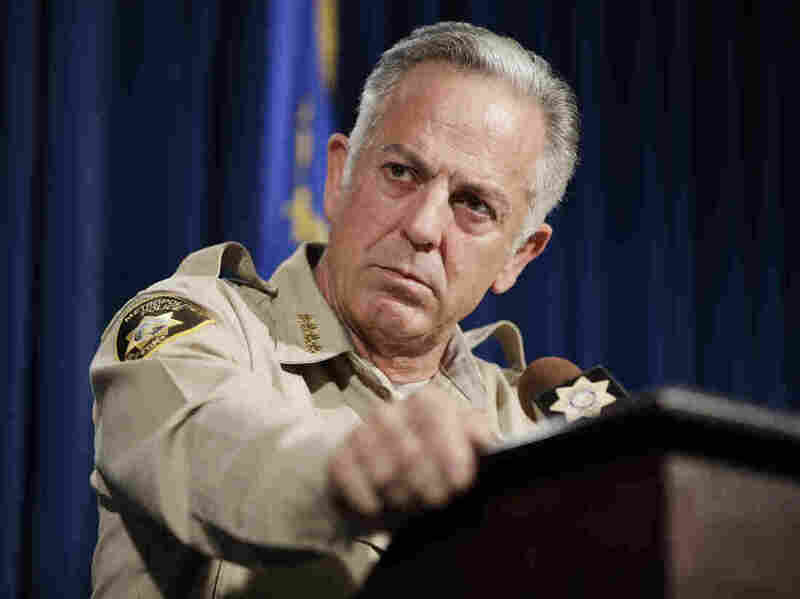 Clark County Sheriff Joe Lombardo announced the end of the department's investigation of the October 2017 mass shooting in Las Vegas on Friday. Lombardo told reporters that officials could not determine a "definitive motive" that prompted the massacre. "The goal of our investigation all along was to provide the public with the clearest picture possible of the events leading up to Oct. 1, as well as motive," Clark County Sheriff Joe Lombardo told reporters at news conference. "What we have not been able to definitively answer is the 'Why Stephen Paddock committed this act?'" he said. The public briefing coincided with the anticipated release of the 187-page report prepared by the Las Vegas Metropolitan Police Department's Force Investigation Team. It is the culmination of a 10-month investigation of the shootings that left 58 people dead and hundreds more injured at an outdoor country music concert. Lombardo confirmed that 64-year-old Paddock acted alone when he fired a hail of bullets out the window of his hotel room at the Mandalay Bay Hotel and Resort. The sheriff also quashed all rumors of conspiracies. "There's been no other gunman identified," he said, adding that the department does not anticipate charging any other individuals. Lombardo described Paddock as "an unremarkable man" who many people — including one of his brothers — said had mental health issues. The report includes notes from an interview with Paddock's brother Eric Paddock, who "believed Paddock may have conducted the attack because he had done everything in the world he wanted to do and was bored with everything. If so, Paddock would have planned the attack to kill a large amount of people because he would want to be known as having the largest casualty count. Paddock always wanted to be the best and known to everyone." Another brother, Bruce Paddock, told investigators that "Paddock was suffering from mental illness and was paranoid and delusional." A Las Vegas doctor, identified as Paddock's primary care physician, told investigators he believed the gunman may have had bipolar disorder but the he had refused medication to treat it. He also described Paddock's behavior as "odd." Several people interviewed noted Paddock's passion for gambling and his disinterest in political or religious beliefs. "I would personally call it a terrorist attack. It had an influence on a certain demographic of people [and] intended to cause harm," he said. But he acknowledged the crime, while heinous, does not meet the FBI's standards for terrorism. Investigators released body camera footage recorded by two officers that includes the moments before police enter Paddock's hotel room using explosives and find him dead from a self-inflicted gunshot. As a team of officers walk through the suite, they tally a cache of weapons lying on the ground and in the bathtub. In February, federal prosecutors charged the ammunitions dealer who sold Paddock armor-piercing bullets and more than 700 tracer bullets. The latter are built with a pyrotechnic charge that produces a bright trail of light to allow a shooter to see the bullet's trajectory during nighttime firing or other low visibility scenarios. NPR's Camila Domonoske reported last month, "MGM Resorts International, which owns Mandalay Bay and the concert venue, and several of its associated companies have filed lawsuits against victims, asking federal judges to step in and declare the resort company free from liability."